The Return of Pianist Peter Delano celebrating his Suunyside release "For Dewey"
One of the original New York “young lions,” pianist Peter Delano, makes a welcome, much-anticipated return to his New York stomping grounds with a special appearance at the APAP Convention on Saturday, January 10th, 2008 at 4:20pm in the Harlem Suite of the Hilton Hotel, in celebration of the 1996 recording with Dewey Redman, just released on Sunnyside Records, "For Dewey." The first time I watched him was in 1994, on the LaserDisc "Carnegie Hall Salutes The Jazz Masters - Verve 50th Anniversary", later reissued on DVD in 2002, but only in Asia. New York pianist Peter Delano thrived in the nineties….a leader of the pack, a photogenic child prodigy, an impossible teenage amalgam of McCoy Tyner’s chordal power, Bud Powell’s linear luminosity, and Keith Jarrett’s pianistic poetry. A student of Red Rodney’s pianist Gary Dial, Delano performed and recorded with the likes of Michael Brecker, Gary Bartz, and Lewis Nash, and burst on the scene with his self-titled 1993 Verve debut, at the age of seventeen, followed by his 1994 Polygram release "Bite of the Apple." He enrolled at Columbia University, but tragically, suffered a debilitating back injury that forced him to stop playing, until he resumed his career in 2007. 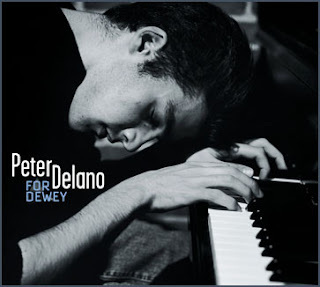 "For Dewey" represents for Peter Delano not only a return to the world of recorded music; it also marks the re-emergence of a shining star in a galaxy of jazz talents.